Originally from Kemerovo, Siberia, Julia met her British husband Matt on holiday in Turkey when she was 17. Julia taught herself to bake from a young age, however, any time she wanted to bake, she would have to save up money from her after school job to buy the ingredients. 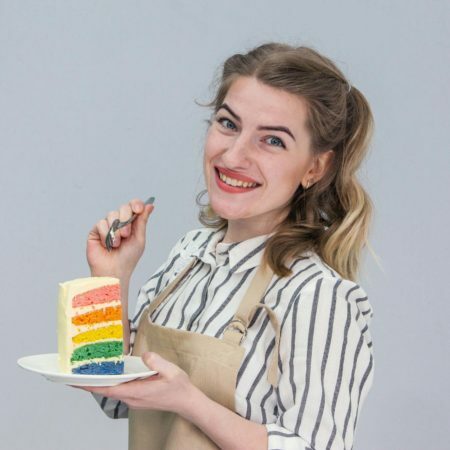 After moving to the UK, Julia dreamed of applying for The Great British Bake Off and so she spent three years practising and studying British bakes in particular, so she would have the knowledge and skills she needed. Julia’s Bread Week Showstopper recipe is a family classic, even if the shaping of the sculpture wasn’t quite family-friendly. Sweet and showstopping in equal parts, Julia’s Caramel Week decorated cake makes for a great celebration cake.